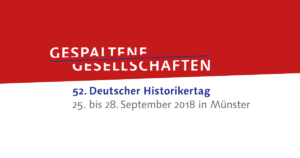 The German Historical Association (VHD) held its bi-annual meeting, the Historikertag, from 25-28 September in Münster, Westphalia. The 3.700 visitors debated the theme “Divided Societies” (“Gespaltene Gesellschaften”) in almost 100 sessions and panels ranging from ancient to contemporary history. The topic was also intensively discussed with regard to historians’ role in the present. Initiated by Dirk Schumann and Petra Terhoeven from Göttingen and supported by a group of a dozen historians, the General Meeting on 27 September passed a resolution on the present threats to democracy (“Resolution des Verbandes der Historiker und Historikerinnen Deutschlands zu gegenwärtigen Gefährdungen der Demokratie”). An overwhelming majority of the several hundred members present voted in favour of the Münster declaration (pdf). The resolution defends key principles against present-day threats posed by populists’ voices and activities. It argues amongst others for a historically sensitive language against discriminatory cries like “Volksverräter” or “Lügenpresse” reminiscent of the anti-democratic rhetoric in Germany during the first half of the twentieth century. It further appeals to hold up humanitarian principles and international law with regard to asylum seekers and refugees calling to mind past German deeds and experiences. The declaration also mentions the search for European cooperation that emerged from the bitter strife and conflicts during period of two world wars as well as the principles of debating in pluralist democracies. The resolution concludes with an appeal to study the past critically so that political abuse in the form of fake history can be rejected based on scholarship. During the General Assembly and in a panel discussion on the previous evening, members of the German Historical Association discussed not so much the detailed points in the draft resolution, nor did they question the exact wording. A large majority appeared to support the key principles. The foremost question was whether and how historians should intervene in political debates. Some argued against a resolution on particular political issues although they generally supported the ideas and values of the text. They preferred to focus on threats to freedom of research and the democratic conditions necessary to maintain that freedom. Few saw the resolution as a party political statement or pointed out that a rhetoric of crisis might fuel the danger. That the declaration was also directed against the Alternative für Deutschland (AfD) was plain without that party being explicitly mentioned. Nevertheless, most recognized that the text was on the defence of principles rather than policies and does not support positions of any single political party. Those in favour agreed that historians should give guidance based on their scholarly expertise. Historical guidance for the public usually takes the form of analysis and historical explanations. However, it seemed to the majority that present threats called also for normative statements. One speaker reminded the assembled historians of Theodor Mommsen’s intervention in the anti-Semitism debate in 1880 and declared that Mommsen’s principled stance may serve as a positive reference for today’s German Historical Association. Distinguishing between the historian as scholar and expert on the one side and the historian as citizens on the other was described as a moot and artificial point under present circumstances. It was felt that historians should explicitly defend those principles of pluralist society under attack from populism at present. One speaker from Chemnitz and another one from a memorial site (Gedenkstätte) in Lower Saxony strongly urged those present to pass the resolution because they needed this kind of support by the professional organisation against the current, sometimes daily threats to their freedom of research. The final vote by showing of hand demonstrated that German historians as an organised profession overwhelmingly recognized the present threats and saw the need to defend key principles of pluralist and democratic society.